Now that Twitter is public and wants to take its IPO out for a spin, the social media/microblog giant is looking for novel ways to promote its stock. So, the Twitter employed twits to do some research and found out diversity does’t just represent ‘Merica … it sells itself too! 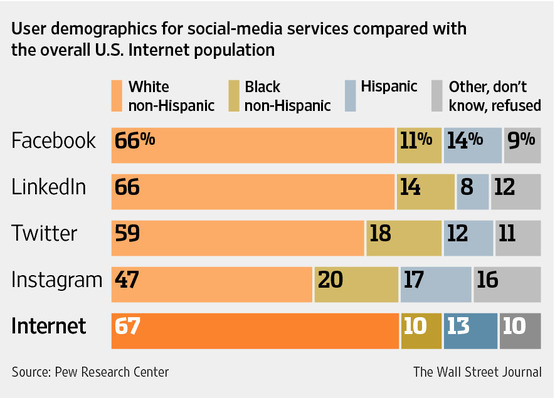 The graph above was supplied by Pew Research and the Wall Street Journal to shed some light on its users that are more diverse than the uber social media icons. This new diverse appeal isn’t an accident: in November, Twitter hired Nuria Santamaria as multicultural strategist, and the cutesy chirp-chirp is feeling her influence in more ways than one. Ms. Santamaria says advertisers want to know more about racial and ethnic minorities on Twitter, from basic numbers to the languages in which they tweet. Last month, Twitter began showing ad agencies data from a coming report saying that Hispanics tweet more often than other users and activity among them rises when the conversation is about technology. So, if that makes you want to buy stock, enjoy. And if you, like the rest of us, don’t understand the stock market, then you’ve probably moved on to a story about Justin Bieber. So enjoy that too.